t H e le A de R MARCH 2018 35 Investment • Shared-services model: Organizations that struggle to meet complex business requirements with a supplier can always invest to develop capabilities themselves (or, insource). One approach is to develop an internal shared-services organization (SSO) with the goal of central- izing and standardizing operations that improve efficiencies. A shared- services model is an internal organization based on an arm's-length outsourcing arrangement. Using this approach, processes are often centralized into an SSO that charges business units or users for the services they use. In some instances, SSOs are formed externally to the company (such as a subsidiary). • Equity partnership (e.g., joint ventures): An equity partnership creates a legally binding entity. They take different legal forms, from buying a supplier (an acquisition), to creating a subsidiary, to equity-sharing joint ventures or entering into cooperative (co-op) arrangements. Equity partnerships are best used when an organization does not have adequate internal capabilities and does not want to outsource. Many factors go into pricing strategies Once CREFM decisions are aligned with the overall business strategy, facility-management executives need to consider pricing. Some important considerations include: • Risk: How is it allocated between the service provider and the client, who is responsible for contracting, who is legally liable, and who cov- ers downstream subcontracting risk? • Financial: Who makes the decisions on cost, who is paying the invoices, who is approving the payments, who is actually making the payments and, lastly, whose money is at risk? • Operations: Who is deciding "what" gets done and "how" that "what" is to be achieved? And, how much administration is the client willing to take on in the maintenance of the contract? • Transparency: What level of visibility is required into cost, profit margin, volumes, etc.? Sorting out the above considerations is a complex process that could benefit from outside advisors to tap expertise not available within the CREFM organization. The resulting decisions will help in determining what services should be outsourced as well as which pricing/contract model is most appropriate. 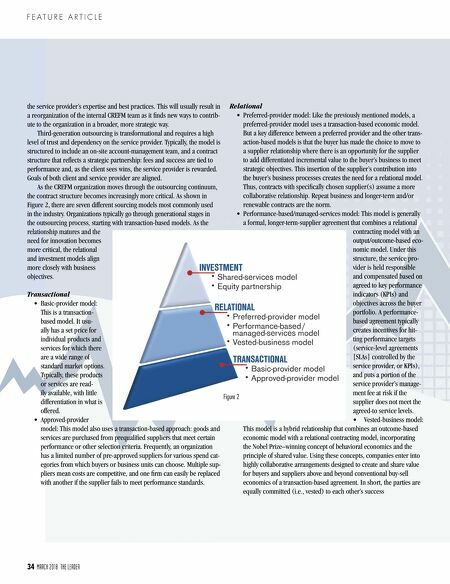 There are four prevailing pricing models in the industry: • Fixed price: Client pays a set price at an aggregate level for a defined scope of work. Price is inclusive of labor, materials, profit, and overhead. Price changes occur solely when the scope changes or negotiated variables are modified (e.g., indexing). • Time and materials: Client pays for the amount of time providers spend delivering the service, typically priced on a set price per hour. The hourly rate is fully loaded with all salaries, benefits, overhead, and profit. • Unit pricing: Client pays a fixed fee for a defined unit of service, such as per square foot or meter, per hour, per move. The volume of "units" is the only variable, although many times the actual price per unit varies based upon volume. • Direct cost: Client pays for the actual cost of delivering the service. The service provider is compensated for overhead and profit, either based on a cost-plus negotiated margin or a fixed, negotiated fee that varies based upon negotiated volume tiers. No single solution is always right and, oftentimes, a combination of structures is used. In the industry today, the direct-cost model is used more often than not, as it gives the client full transparency into actual cost and volumes. Still, unit pricing is common for services such as call centers (e.g., a fixed price per call or per submitted work order). There are many factors to consider prior to making the decision to out- source. Will it make us more efficient? Will it reduce the cost of managing our real estate portfolio? Will it create environments that drive performance and add shareholder value? Will it provide a competitive advantage? Is our organization mature enough, and can we manage the change? 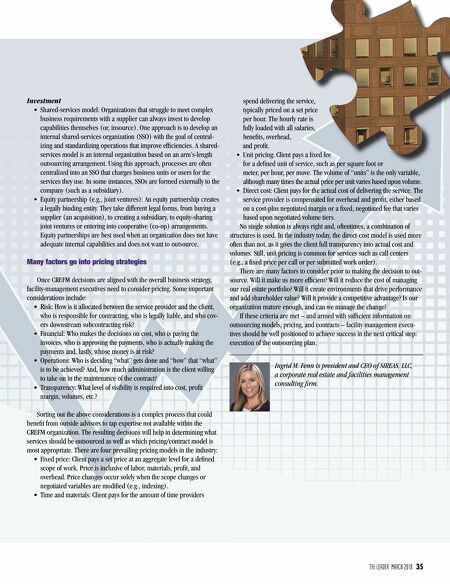 If these criteria are met – and armed with sufficient information on outsourcing models, pricing, and contracts – facility management execu- tives should be well positioned to achieve success in the next critical step: execution of the outsourcing plan. Ingrid M. Fenn is president and CEO of SIREAS, LLC, a corporate real estate and facilities management consulting firm.